Original Vintage Posters such as Circus Posters, Antique Magic posters, Political posters and other highly collectible Americana memorabilia Treasures. *NOTE: If you see "SOLD OUT" on an item you're interested in, let us know. 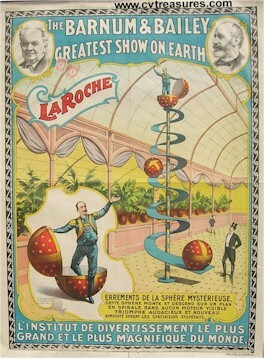 Here you will find some of the most amazing ORIGINAL Rare Vintage Circus Posters from the late 19th Century to through the 1950s. From the major circus companies like Ringling Brothers and Barnum to Bailey to Clyde Beatty & Wild Bill Cody along with lesser known old circus posters. The modern and commonly held idea of a 'circus' is of a Big Top with various acts providing entertainment therein. However, the history of circuses is more complex, with historians disagreeing on its origin, as well as revisions being done about the history due to the changing nature of historical research, and the ongoing 'circus' phenomenon. For many, circus history begins with Astley, while for others its origins go back much further—to Roman times. up the first modern amphitheatre for the display of horse riding tricks in Lambeth, London on 4 April 1768. Astley did not originate trick horse riding, nor was he first to introduce acts such as acrobats and clowns to the English public, but he was the first to create a space where all these acts were brought together to perform a show. Astley referred to the performance arena as a Circle and the building as an amphitheatre but these were to later be known as a Circus. Astley was followed by Andrew Ducrow, whose feats of horsemanship had much to do with establishing the traditions of the circus, which were perpetuated by Henglers and Sangers celebrated shows in a later generation. In England circuses were often held in purpose built buildings in large cities, such as the London Hippodrome, which was built as a combination of the circus, the menagerie and the variety theatre, where wild animals such as lions and elephants from time to time appeared in the ring, and where convulsions of nature such as floods, earthquakes and volcanic eruptions have been produced with an extraordinary wealth of realistic display. In 1782, Astley established the Amphithéâtre Anglais in Paris, the first purpose-built circus in France, followed by 18 other permanent circuses in cities throughout Europe.. Astley leased his Parisian circus to the Italian Antonio Franconi in 1793. Bostock & Wombwell's Circus Poster Very RARE!